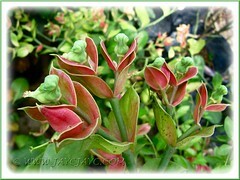 An attractively beautiful shrub, Euphorbia bracteata is home to numerous quaint-looking birds when it blooms. Figuratively speaking, of course! They’re not our feathered friends, the chirpy and lively birds in the real sense but flowers that appear so similar to birds that make them as desirable to have in the garden. Our special thanks to a generous Church friend, Connie, who first introduced us to this lovely plant by presenting us a couple of seedpods and a stem cutting last May. In addition she gave us 2 potted seedlings several months later when propagation failed. We’re glad her persistence paid off and we now have them growing well, though a tad too slow, in our garden. Looking forward impatiently to enjoy the green birds on our plants, probably a year from now. According to some traders, this plant that showcases pretty bird-like flowers, named ‘Xiao Niao Hua’ in Mandarin which is literally translated as Little Bird Flower, is considered to bring good fortune to its owner. Hence, its popularity during the Chinese Festive Season with hefty prices, ranging from RM30 to RM300, depending on the size. Of course, we did not buy those sale gimmicks but are most captivated by the many dainty green birds that perch between the reddish-pink bracts of the flowering shrub. Little Bird Flower is definitely an extraordinary plant that commands attention and is a great conversation piece. Botanical Name: Euphorbia bracteata (syn: Pedilanthus bracteatus, Diadenaria pavonis, Tithymalodes bracteatum; and more than 20 others are listed at The Plant List). 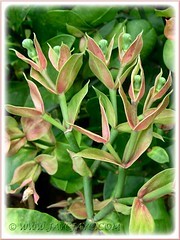 The genus Pedilanthus had been reclassified and included in the genus Euphorbia since 2003. 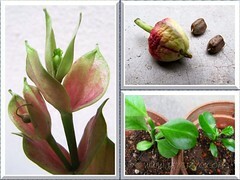 Common Name: Little Bird Flower, Tall Slipper Flower, Slipper Plant, Candelilla, ‘Xiao Niao Hua’ in Mandarin, ‘Pokok Burung Indonesia’ in Malay. Etymology: The genus name, Euphorbia was assigned in 1753 by Carl Linnaeus, the botanist and taxonomist, to honour Euphorbus, the Greek physician of Juba II. The species epithet bracteata means having bracts, referring to its attractive and conspicuous bracts. Origin: Native to dry deciduous woodlands in Mexico (Sonora to Guerrero). Features: Euphorbia bracteata is an attractive species of the genus, Euphorbia that consists of more than 2000 species of flowering plants. An evergreen and multi-branched perennial shrub that has an erect form and grows slowly between 1-2 m tall (or up to 2.7 m in habitat) and generally is about 0.6-1.2 m in width. Cylindrical and green-coloured stems that branched out from the base are succulent and usually sparsely hairy, bearing medium green leaves that are alternate, simple, ovate and pubescent, with keeled midrib beneath and almost without petioles. Whatever, it is the bird-like flowers that dazzle the admirers. 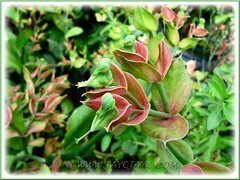 Under good growing conditions, a matured Euphorbia bracteata will bloom prolifically throughout the year. It will produce abundant cymiferous inflorescences at terminal tips, known as cyathia. 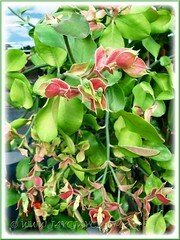 Each cyathium consists of one female flower and several male flowers that are enclosed in a cuplike cluster of paired reddish-pink bracts (modified leaves). Simply put, to our naked eyes, Euphorbia bracteata has pretty pale to bright green flowers that resemble tiny birds, nestled between pairs of attractive pink to reddish bracts, that attributed to the plant being aptly nicknamed Little Bird Flower. The beautifully coloured bracts will start off as green and gradually blush to reddish-pink in lovely contrast with the green foliage, while the green birdie flowers will turn yellow when they are pass their prime a few weeks later. If flowers are pollinated, fruits eventually develop into 3-lobed capsules bearing 3-4 dark-brown seeds that can be used to germinate new plants when ripened. 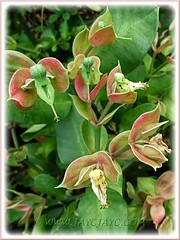 Culture (Care): Euphorbia bracteata grows easily with minimum care. Light: Full sun to light shade for best growth and flowering. Can tolerate deeper shade but plant will be more leafy, with less flowers. Moisture: Medium water requirements. When mature and established, it is drought tolerant and needs occasional watering. 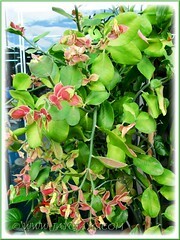 However, it thrives best with regular watering during the hot seasons. Soil: Prefers well drained, nutrient-rich, sandy or sandy loam soils. Others: Feed once monthly with a balanced fertilizer. Prune off flowering stalks that are no longer blooming to encourage branching and increase flowering. Staking may be necessary for a matured multi-stemmed bush to prevent branches from flopping and maintain a pleasing appearance. Like many plants in the Euphorbiaceae family, Euphorbia bracteata or Little Bird Flower is known to ooze a milky-latex sap that may cause skin irritation or allergic reaction in contact. Do wear gloves when handling or pruning the plant if you’re prone to skin rashes. Generally it is pest and disease free. Mealybugs can be a problem, so be vigilant and treat it early. For subtropical and temperate regions: Hardiness: USDA Zone 9b-11. Winter hardy to 25°F (-3.8°C), though some have claimed it as being hardy to 20°F (-6.7°C). Flowers from late spring to early fall. Sow seeds indoors before last frost or direct sow outdoors after last frost. In non-hardy regions, it is advisable to grow in a container so that it can easily be overwintered indoors. Water sparingly during the cooler seasons. Propagation: By seeds germination or from herbaceous stem cuttings. 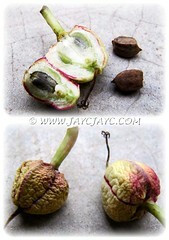 Preferably, air dry the cut surface of milky sap before planting the cuttings. It self-sow easily too from seeds released by its dehiscent dried fruits. Usage: Charming and attractive, Euphorbia bracteata will be ideal as a specimen shrub or grown en masse in a perennial border as a backdrop with low-growing plants or ground-covers in front. An interesting plant that will be an attention-grabber and as a conversation piece. Being drought tolerant it is suitable for xeriscaping. Excellent for container gardening too. 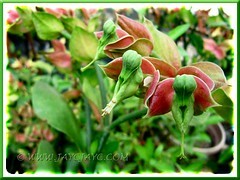 Little Bird Flower plant is attractive to bees, butterflies and birds. Adenium obesum (Desert Rose), attractive from top to toe! Nerium Oleander ‘Pink’ – a beauty and a beast!